It is the holidays, that time of the year when many people are experiencing an incredible amount of stress. There is so much to do and everyone seems to be going in many different directions at once including myself. Recently I caught myself so far out in the future that I was not able to stay present with what was right in front of me. I was so concerned about getting everything on my to-do list completed before leaving on vacation that it felt like I was getting nothing completed at all. The to-do list replaying in my mind over and over like a scene from ‘Groundhog Day’. This is what happens when we worry or stay in our heads, we cannot stay present in the moment. Worry or thoughts of the future or past takes us out of the moment we are in and robs us of opportunities to truly experience what is happening now. It reduces productivity, increases cortisol in the body and wreaks havoc on our immune system. I carry a small apothecary in my bag at all times that consists of various essential oils that I call my first aid kit. Recently while using one of these oils aromatically, the idea for this blog emerged. The essential oil, Present Time, is a blend of essential oils designed to help you focus on the here and now. I had chosen this oil because my current to-do list would intimidate the most savvy time-management expert. While sitting in a moment of quiet meditation allowing the aroma of present time to engulf my senses I was reminded of how precious time is and how frequently it is lost to the past or to the future. As it generally happens for me, within days I was having a conversation with someone who is stuck in the past and worried about the future. I reminded them that being consumed by these thoughts decreases their awareness and causes them to be distracted. 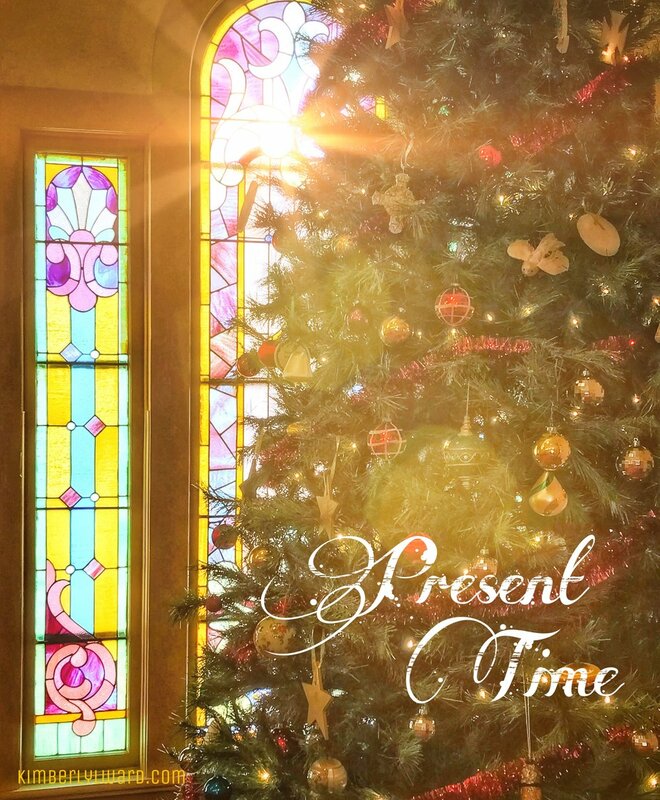 This was my validation to write about being present and to remind everyone that Present Time is not about the gifts being unwrapped but about the time we spend with others. My grandfather was a very wise man and taught me a lot of things but one thing he said to me that I never forgot; “you always have something to give, even if it is only your time”. Being present with someone is a priceless gift that is shared less and less in a society that has become accustomed to text messages and social media. Being present means that you are attentive to right now. It is impossible to give someone your full attention if you are thinking about anything outside of the moment that you are currently experiencing. The internet is a double edged sword; it provides us with a wealth of valuable information at our fingertips. The Internet also distracts us from what is going on in our immediate environment. My message for all of you during this holiday season is to allow ‘Present Time’ to be the gift that you give this year. Turn off your computer, set down your phone and give your full attention to those around you. Your time and attention is the greatest gift that you can give. A unique and special gift that cannot be duplicated or purchased on Black Friday. Present Time is not that moment that the gifts are opened with wrapping paper flying in all directions. Present Time is about gifting others with our true authentic selves fully present in the moment.